Holy cow a blog update from Reaf, and one from me, on the same day? What madness is this. Anyway, I’ve been holding off on doing a proper “top ten” entry for a while. A bunch of shows I’ve been watching since Autumn are only now coming to a close, and its fairer to judge them now they’ve ended than in January when they’re only halfway done. 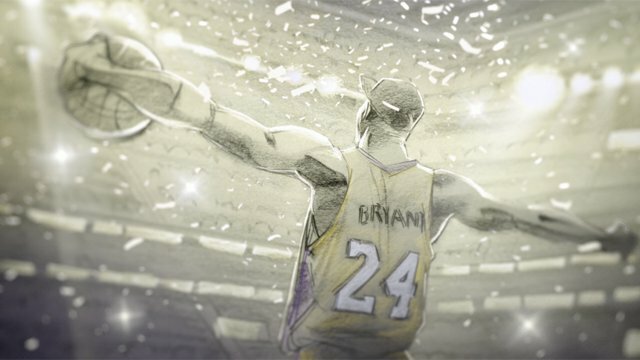 So hit the jump to behold my top ten best anime series of 2012. Small disclaimer that there’s still a ton of stuff I’ve not watched, so if your favourite isn’t there, might well be I’ve not had the chance to watch it yet. You’ll also notice a lack of anything Anicom showed in their best of 2012 session. No idea why. Poor Hibiki. Heading to her first live concert, she can only watch on powerless as the Noise, a weird alien race, assault the event. But fear not, the two singers of Zwei Wing can wield armour to fight bac-oh one of them just died. So begins Symphogear. 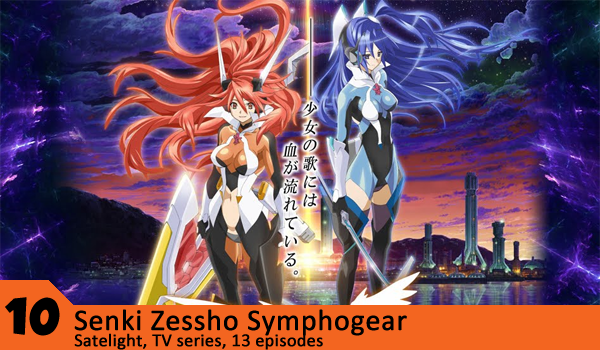 Through the power of song, girls wield the titular armour allowing them and only them to combat the Noise and save the world, who exist and are attacking for reasons never really explained much. If you’ve actually heard of Ozma (or Ozuma), plus points for you. Written by Leiji Matsumoto, the guy who did amongst others, Space Battleship Yamamoto, Captain Harlock, and more recently Interstella 5555, this series seemed to fly under the radar in impressive style. Heck, if I’d not seen a random review of it by chance in Summer, I would’ve missed it too. 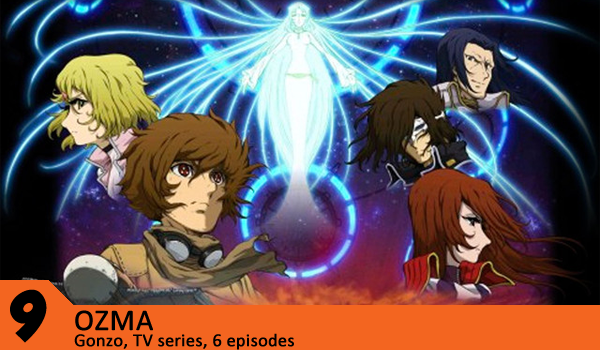 Set on a future Earth where events have led the planet to be covered in sand, a group of pirates is chasing the giant sand whale, Ozma, before they bump into the runaway girl Maya. Before you know it, they’re on the run, which involves some superb undersand combat (by which I mean actual tactics are involved, not just blast missiles everywhere and believe in yourself because that’ll get you through fine). Combine that with a 90s esque style of character design and animation (they have noses, goddamn), and some interesting environmental themes in the background, and you’ve got yourself a pretty cool show, and at only 6 eps you could watch this all in hours. It doesn’t do a lot, but what it does is well thought out and superbly executed. Ah, Kyoto Animation, the ultimate love them or hate them studio or modern animation. Responsible for a slew of popular shows including Lucky Star, Haruhi and K-On, these guys know how to make money by the barrel full. This story, like so many of theirs, revolves around a highschool club, whom… no, its not a harem show, don’t worry. 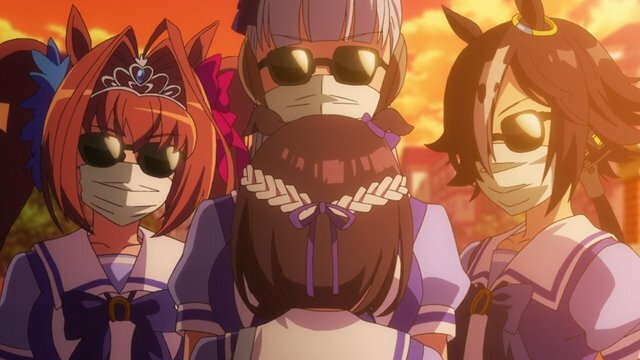 Anyway, the four of them, led by Houtarou, a man who’s philosophy in life is to always expend the least energy possible in anything he does, ends up getting dragged around by Chitanda to solve numerous weird mysteries from around the school, all to sate her curiosity. That probably sounds bland, but the tangents they go on along with interesting characters and mysteries make for some intriguing resolutions, and KyoAni’s usual flare is always on display. Sadly, the series does seem to self-indulge a bit too much at times, especially with the two-pronged cultural festival arc which drags on and on, leaving little time for any meaningful conclusion at the end, giving the climax a disjointed feel. An enjoyable show, but one I wish that had done more with what it had. 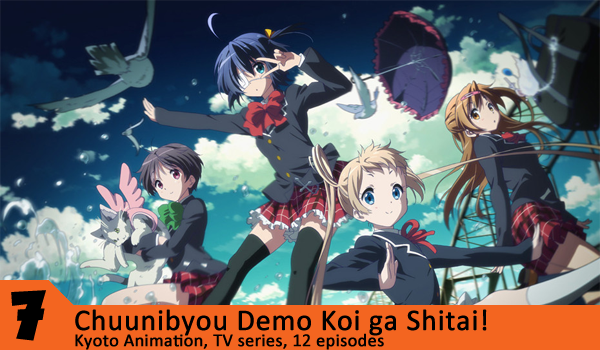 KyoAni’s other 2012 show, this one was much more of a love it or hate it affair. I imagine a lot of it comes down to how well you can relate to the cast and their antics. I could, so loved this show. Others didn’t, and saw it as the usual KyoAni moeblob rubbish. But to me, it was weirdly endearing. The adventures of the Dark Flame Master, the Tyrant’s Eye and company reminded me of some parts of my childhood, and watching their imaginary world collide with the real world made for some brilliant comedy in both the first half and the accompanying ONA series. What I didn’t see coming was the relationship focused second half, and by that I mean there actually was a relationship, not the usual modern anime thing of implying it but never going anywhere with it. Sadly the ending was a little jarring, a forced resolution to what’d been a great show up to that point. If your inner child’s still alive and well, you’ll probably get a kick out of this, but if the thought of KyoAni is sickening, best to be avoided. 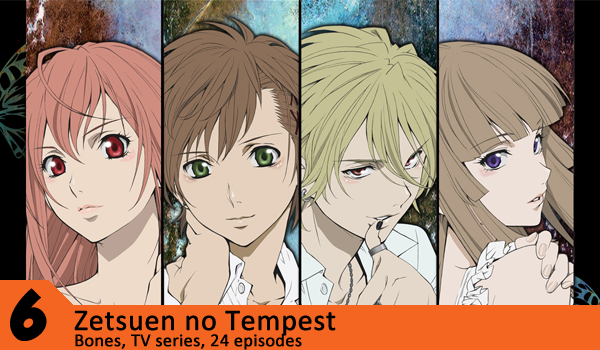 What do you get when you combine Tempest and Hamlet and make the result an anime series? This show right here. With people of the world metalising, our two male leads, brought together by the death of their close friend, team up with a mage stuck on an island to save the world from the Tree of Exodus, using the magic of the Tree of Genesis to help. Weirdly enough, this show doesn’t then turn into a battle of the week shonen, instead utilising a great plot and storytelling combined with great characters, each with individual motivations, with an enthralling end result. The only main problem is that to get this story across takes the show forever. You won’t notice it as you watch it, but when you look back you’ll wonder why it took so many episodes to essentially resolve one discussion. This gets worse in the second half where the pace eases up a lot, creating a lull where little actually happens until the final few episodes. Despite that though, it’s definitely worth a watch, whether you’re a fan of Shakespeare or not. Into the top five, with shonen supershow Magi. I haven’t enjoyed a shonen this much since I saw Soul Eater. 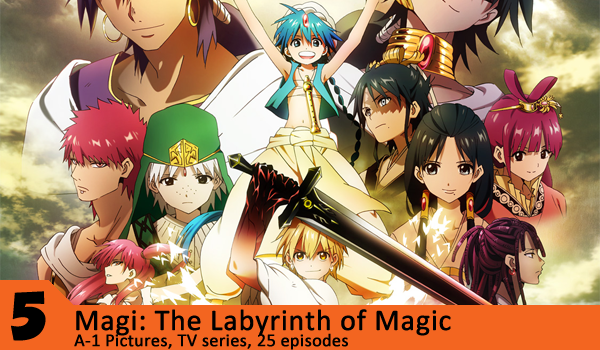 Nicking the setting and names of Arabian Nights, Magi follows the adventures of Magi Aladdin and slave Alibaba as they try to save the world from being thrown into chaos and conquered by the Kou Empire and other more sinister enemies. 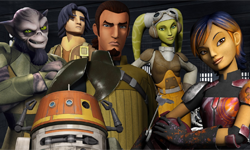 The unique setting went someway to helping this stand out, but its the cast of characters that work wonders for this series. There’s not a simple dull, bland or boring person among them, and they rarely fall back on tropes either. Add in usually great animation (although with A-1 being so busy there’s the odd noticeable drop), and a good, if drawn out, plot, and by the end you’ll be wishing it was a long-running show instead of only 25 episodes. 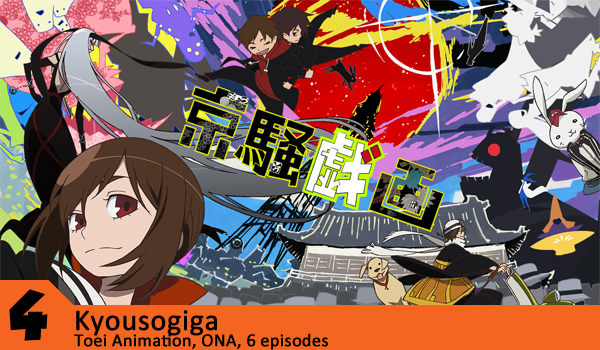 How to describe Kyousogiga. Well, it’s certainly the weirdest show in this list, and the only non-TV one too. The best comparison I can think of is FLCL. Except unlike that show, this story is more about the world than the characters. Over the 6 episodes (first was done in late 2011, then five more in the Autumn just gone), you get glimpses of the day-to-day lives of the people who inhabit said world, and the events that happen there. The total runtime of the thing is about an hour, and honestly… I’d struggle to describe it, it’s better to just watch. What I can say, is that this thing radiates fun. The characters, the world, the stories, it’ll all leave you with an unexplainable goofy grin on your face, and a craving for more when it’s over. And I genuinely hope there is more to come in the future, as this world is just too intriguing to be left be. Please make it so Toei. If I’d wrote this list a few months back, at the end of 2012, this’d be the show at numero uno. Revolving around the short, fat and bullied Haruyuki, one day he finds out he’s been beaten at in essence his favourite Second Life game, and from there is dragged into the accelerated world and a whole new lifestyle by school princess Kuroyukihime (not revealing her real name is something the show loves doing). 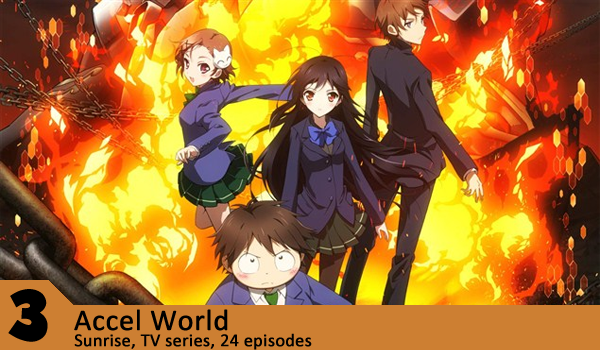 In this new world its survival of the fittest, as the players all have avatars based upon whatever trauma they’ve endured in life, as he helps his clan in the hopes of reaching Level 10 and meeting the creator of the Brain Burst application that runs Accel World. I’ve probably made that sound like a generic shounen / mech combo, but this is so much more than that thanks to near flawless execution. 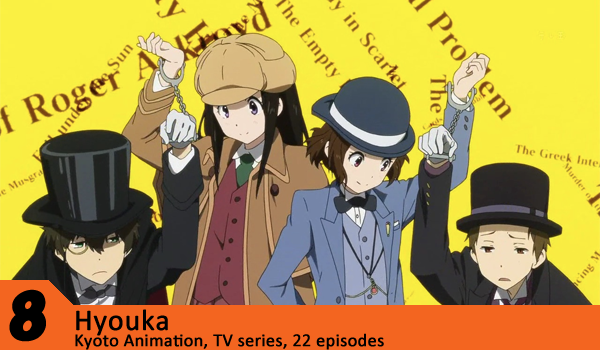 Good writing, interesting characters (when was the last time you watched a show with a fat midget leading), and nice animation, this never really had a dull moment, and even caught you off guard from time to time with some great twists. Battles were fun to watch and not always quite as easy to second-guess as you might think, and the darker second half impacting their real world lives took this show to another level. But as I said, that was my favourite then, three months ago. Then these two came along. 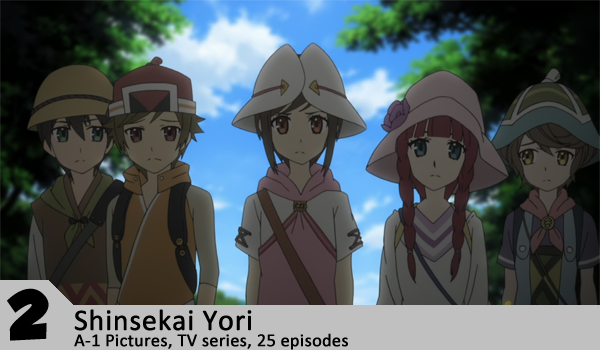 Set in a future where the emergence of psychic powers in some of the populace endangered and eradicated most of humanity, forcing the remainder to strictly control the powers called Cantus to ensure the survival of themselves as a species, Shinsekai Yori follows the lives of a pod of six schoolchildren as they mature, coming to grips with their powers, and the dark and unknown history of the world in which they live. As they grow up (and that’s actual growing up, they go from 14 to 36 over the course of the show), they encounter queerats, tainted cats and other, more sinister species, including the elders who always seem to have weird agendas. fascinating to watch unfold, in part due to the superbly detailed and realised world and backstory, leagues above most other shows, this is simply epic from beginning to end. 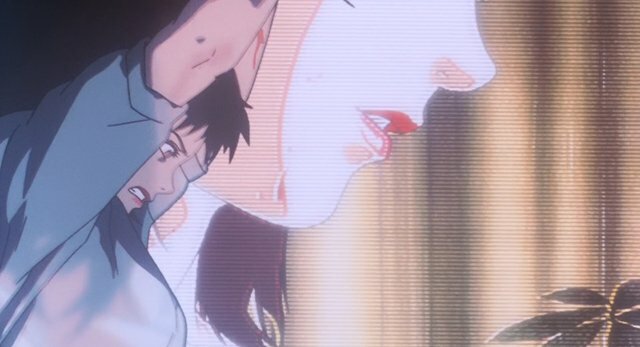 I won’t spoil what happens over the course of the show as that’d detract a fair bit from watching it unravel and theorising for yourself, so let me just end this by saying Shinsekai Yori now proudly sits in my top five anime of all time. In any other year, this would easily have been the best by a mile. But this wasn’t any other year. Ha, as if. 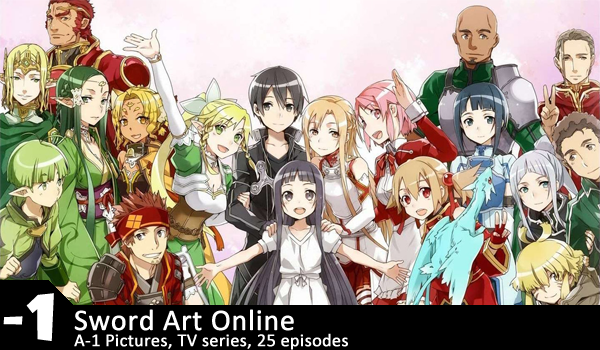 Mocking SAO never gets old. I recently learned this was written by the same guy who did Madoka and Fate/Zero. Which made me all the more surprised at just how much I loved this. People who’ve watched Minority Report or Ghost in the Shell will be fairly familiar with the setting. A future Tokyo, cut off from the rest of the world, where the populace’s mentality and likelihood to commit crime can be monitored, allowing the police and companies to act before problems occur. The story mainly revolves around new to the job Detective Akane and her colleagues, including Enforcer Kounami, judged a latent criminal by the system but whom is allowed to be a hunting dog for the police in exchange for a life outside of prison. Questioning whether you can, and whether its right, to perfectly pre-emptively judge criminals, and what happens to that system when it encounters people it can’t judge, such as the villain of the show, Makashima, this thrilled, shocked and awed from beginning to end. 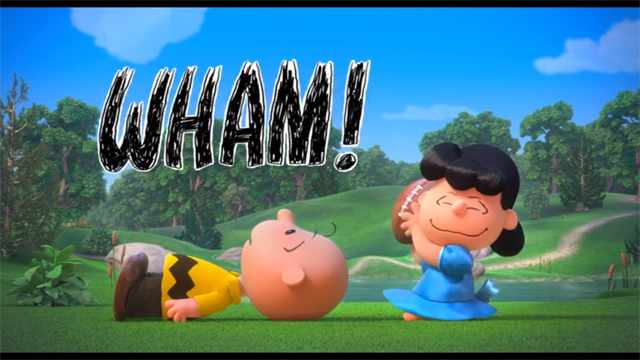 Superb characters, superb animation, superb plot, superb soundtrack, superb… everything. 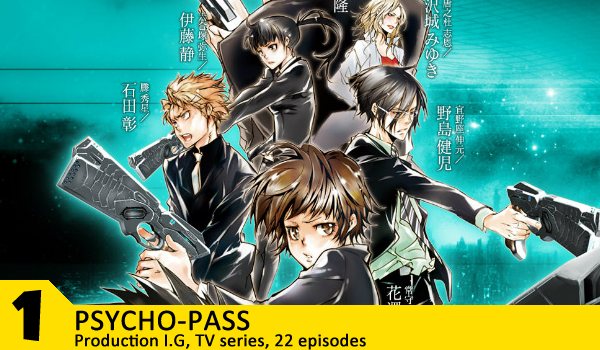 One of the strongest recommendations you can give not just to anime but any media is when you’d recommend it to people who normally don’t care about them, and Psycho-Pass earned that distinction. A standout show in a strong year for anime, this deserves its place as Anime of the Year, in my eyes anyway. Should mention in closing though that there’s still a ton of shows from 2012 that I need to watch. Stuff like Another, Lupin III, Kids on the Slope, Moyashimon Returns, Tsuritama, Space Bros and more besides, so who knows, maybe if I was to write this list in another year it’d be different again. That’s how it stands now though with 2012 a fading memory. Next time, I’ll look at the best the recent Winter 2013 lineup had to offer.